Construction projects are increasingly focused on means and methods that support the environment. Metalmaster Roofmaster is proud to be doing its part with environmentally friendly roofing systems. We use light absorbing, cool colors, local products and companies and vegetated roofing systems. 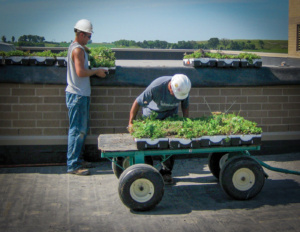 We are manufacturer certified installers of LiveRoof, Weston and Midwest Green Roof and support LEED projects, U.S. Green Building Council and other green associations. Please contact our office for more information on going green.